The Pearly Gates neck captures all the mojo of the original neck pickup from Billy Gibbons 1959 Les Paul. It is a P.A.F. with a unique tonal character, and more midrange than typical humbuckers from that time. The result is a neck pickup that cuts through with its stronger tailored mids, but still has the open and airy treble attack of the alnico 2 bar magnet. 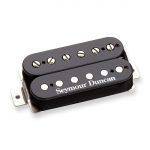 Combined with a warm, spongy low end, this pickup is great for both rhythm and lead playing.